Looking back, I feel like I could have posted quite a bit here and haven't. So here's the catch up post! Last summer was great - but more of the norm. The winter seemed exceptionally cold - the new neighbors from Texas realized they didn't know what cold felt like until we had a good ice storm. This past May I did the Tough Mudder challenge, and had a blast. Beat up and dirty, I couldn't wait to do it again. Jenn and Heather came to cheer me on and it was all the encouragement I needed. This summer we had some good rides, including 1100 miles over four days to visit friends in Syracuse, a trip to Niagara Falls, then down to the Bronx for a couple days of visiting family and checking out the city. School has started, Jenn's in fourth grade now. Hoping to get back on a little easier schedule so we can spend a little more time doing the fall activities before we miss the chance. This spring has been so much fun (once it finally arrived)! 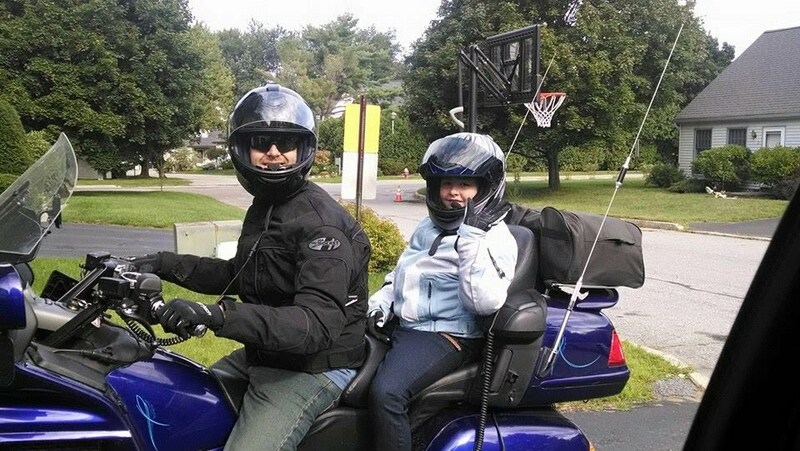 We got the new bike out, which Jenn absolutely loves. I can't wait until we actually spend a day or two on it, instead of just trips to school or work. Speaking of Jenn, I am still amazed at how activities all seem to pile up together at the end of the school year. Between softball, dance, cheerleading, and everything else, I wonder how we'll ever get through it. Somehow we manage (mostly due to Heather's coordination of tasks) and it all comes out okay. The sad part is that they all end around the same time too, which means a whole different routine starts up - summer camp! We had a stint of warm nice weather which is finally over - rain is forcasted for the weekend. In some ways, I'm happy about that - it means some family time with Heather and Jenn, along with getting some housework done that's been looming. Yup, that time of year again. For once we actually got a break on yardwork and were able to get the leaves bagged and off to the dump early enough (Halloween weekend) and the lawn mowed TWICE! It's only been nine years here and we're just now starting to get the hang of being a homeowner. Seems life is either too busy or the weather doesn't cooperate. It was good to get out and enjoy the fresh air that weekend, and Jenn loves the piles of leaves. The squirrels are fattening up (we have a couple ready for stew in our yard) for winter. Now we get to begin the rush of the holiday season, between Heather's birthday, Jenn's birthday, Christmas, and New Years! It all seems to go by too fast, and we never seem to get to do everything we want. Hopefully this year will be different, since I'll be working much closer to home. Happy fall everyone! I know, there is plenty of nice weather still to come. I even prefer spring and fall. Crisp, cool mornings. Nice days without humidity to weigh you down. But let's face it. Summer was always a special time of the year. No school meant a break from responsibilities. As an adult, that summertime break went away in reality, but still stayed with us in spirit. Taking a random day to go to the beach or go shopping, just for fun; it feels better in the summer. And now with school just a week and a half away, it seems it has passed too quickly, with too many missed opportunities to enjoy the time. Thankfully now that camp is over, I have to take some time off, so we'll squeeze in a few more great days. It's hard to believe that kindergarten is already over. I can't say that it feels like it just began, but it certainly seems too soon for it to be done. Our little girl has learned so much in such a short time, and it's amazing that the girl who was just sounding our words last fall now can read books by herself. It's neat to see the sparkle in her eye as we review something she's learned...the light bulb goes off when she gets something that she didn't quite understand. Ah, the holiday season. Aside from the bad drivers on the road and the craziness of trying to buy anything in a store, it's a great time of year. Snow has arrived and made everything pretty and white. Christmas is especially fun, since Jennifer is really at the age of enjoying the magic of it all. We went to Lyndonville last weekend to take the North Pole Express, a train ride to the North Pole to pick up Santa Clause. We sung carols, had hot cocoa and gingerbread men, and even made sure to tell the conductor about the two hobo's on the train. We've been spending some time this week getting the Christmas decorations out. We had a lot going on up until last weekend, but now we can enjoy the holiday time as a family. All my worries melt away when I get to play a game of connect four with my daughter (especially when we beat mommy!!!). 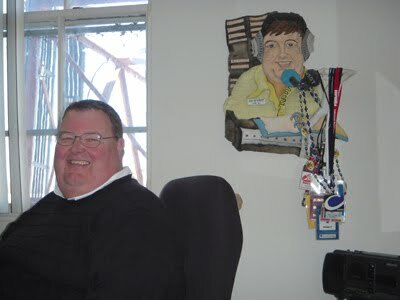 Big John Hill - radio dj forever! For those that might remember, my dad has been in radio longer than I've been alive. Starting on WDOT, moving to WVMT (where I remember hanging out in the studio as a kid, choosing which carts to play). When he moved to Champ to do sales, he still had a radio presence through commercials, remotes, etc. When Ken moved 96.7 to oldies and the DOT crew started, dad was back on the air. Jennifer has loved listening to her poppa on the radio in the afternoon on a regular basis, and I'm grateful she got a chance to know him as a dj! Well, tonight is my dad's last show, and after 41 years will be out of radio. For those that can listen, please do - 96.7 in the Burlington area or http://967dotfm.com/ for live streaming. Love you dad!! So the day has finally come! Our little princess has joined the ranks of the schoolbound. While there were an amazing amount of preparations (new school clothes, new backpack and lunchbag, as well as much discussion about making new friends) we were amazed at how quickly the time came. Even though she had gym on her first day, we all decided that a dress would be okay. 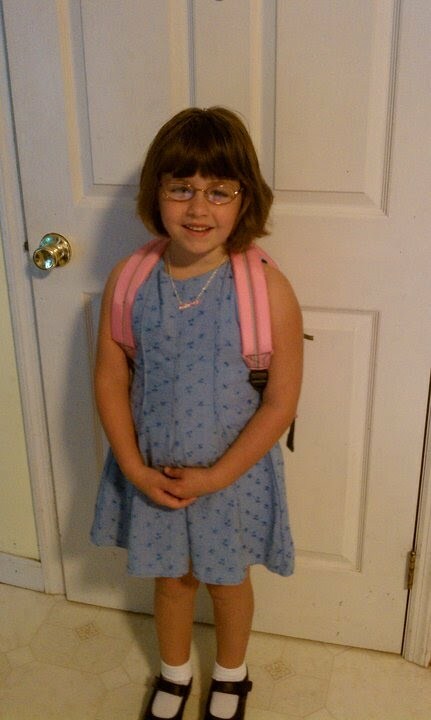 How can you NOT put a little girl in a dress on her first day? As much fun as she's having, you can tell by her behavior that she is TIRED! Bedtimes are troublesome, morning routines are stressful. It's an adjustment for all of us, but one we are all excited about. And to top it all off, this morning while hopping on the bus she sat down with one of her new friends! Now to recuperate over the holiday weekend! So the holiday weekend has passed. Reflecting back, I find that there was a lot more I could have gotten done, but found spending the time with family and friends a lot more enjoyable. To me, spending time with family is important. I grew up adoring my grandparents, and thought nothing even in high school of going over to visit my grandma after school just for fun. I am trying to instill that same love of family in Jennifer, and when weekends like this come up where we can really just kick back, relax, and enjoy our time, I find it necessary to put the other stuff on the back burner. The gardens can be weeded later. The house can be picked up another time. With busy schedules it sometimes becomes difficult to get together as often as we would like. A holiday weekend where everyone expects to fire up the grill, pour a few drinks, and just enjoy the time is rare, so I was glad we were able to truly enjoy it. I ended the weekend with a smile and a happy heart...who could ask for more? Now that the daylight lasts a little longer, maybe I can catch up on some of that stuff I didn't get done yet. 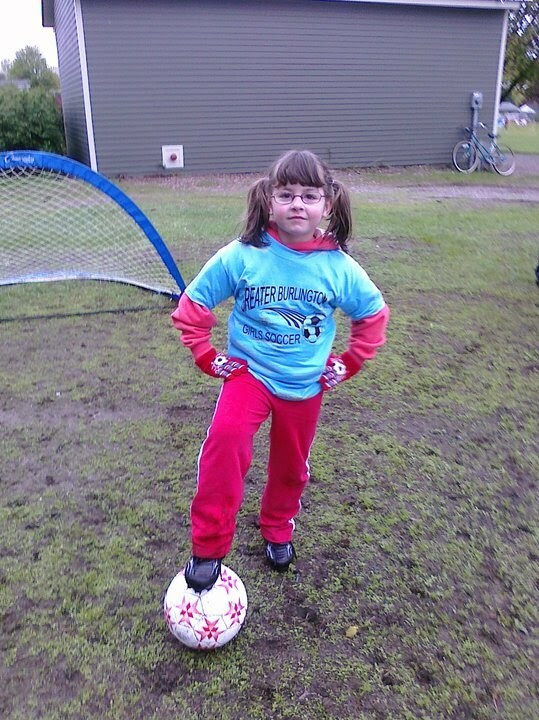 So Jenn had her first official practice and game today. She was a little shy about the whole thing, but the coaches were great and got her playing along. With a little practice, she will be awesome!